WHY I NEED THIS BUG ZAPPER? Flying insect present a major threat to human and pets health, causing diverse types of disease. 2. You can enjoy your time as you like without bothering by those annoying insects with the insect trap! 3. Flying insects are recognizable as a problem both by businesses and their customers and are seen as an irritant.So, to leave your customers and staff a comfortable environment using this electronic bugs killer is necessary. PERFECT SOLUTION AGAINST MOSQUITOES AND OTHER INSECTS IN THE SUMMER! How Does This Insect Trap Work? This insect killer emit the precise wavelengths of UV light that lures the flying insects, drawing them into electrically charged grid and eliminating the bugs upon contact with the high voltage metal grids.Then the insects(mosquitoes,flies and so on)fall into the removable, easy to clean tray. 2.No chemicals involved in it, no fumes, no smell, no sprays, no mess, and pollution free. 3.Independently tested and certified to EMC and all relevant American standards,it is an effective and safe insect killer to rid of any flying insects at home or in commercial areas. 4.A practical, efficient, hygienic and automatic electronic indoor bug zapper system is formed through a accurate frequency of blue light to attract flying insects and a charged grid. Vivreal Indoor insect killer gives an environmentally friendly strategy for getting rid of these mosquitoes from your your indoor parlor. This thing contains extraordinarily successful UV (Ultraviolet) lights that attract the mosquitoes and diverse dreadful little creatures towards it. SO, DO NOT MISS THE OPPORTUNITY! 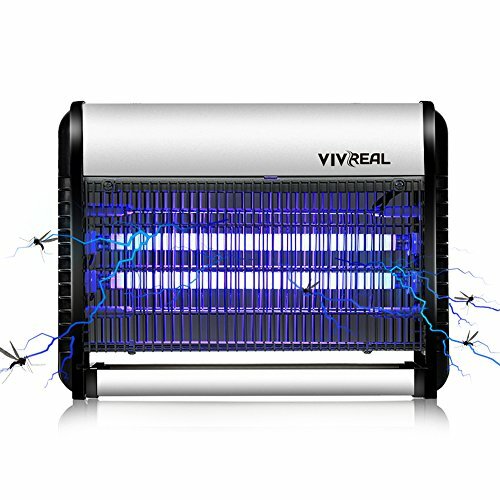 ✔ 【Incredibly Instant Insects Attraction And Elimination with Scientific Proof】VIVREAL bug zapper comes with 2 blue tubes that emits 365 nm wave length, which has been scientifically proven to be highly attractive to lure flying insects such as fruit flies, mosquitoes, bugs, gnats etc. The 2800V high voltage metal grid of this fruit fly trap is guaranteed to wipe out all harmful insects. ✔ 【Totally Physical Pest Control for Maximum Safety & EMC Certificated】 The indoor mosquito trap uses physical method to attract and eliminate insects by UV blue lights. No chemicals involved in the fly killer, no fumes, no smell, no sprays, toxic-free and pollution free, which is harmless to your health. Besides, it is certified to EMC and all relevant American standard. ✔ 【538 SQ.FT Ultra-Large Coverage Area & User-Friendly Design for Permanent Use】High-tech killing grid of this chemical-free electric insect killer creates a massive and effective 538.SQ.FT catch area to kill flying insects efficiently. Drawer-style interlocked collection tray is convenient and easy to clean and remove, maintaining long life span of the insect trap. ✔ 【Hanging/Standing Available, Wide Compatibility Suitable for Indoor Environment】Equipped with accompanying hanging chain, you can easily hang the insect lamp on to the hooks, or simply place on a solid surface. It is ideal for various occasions, such as kitchen, bedroom, living room, dining room, hotel, office, farm or any other place that needs killing mosquitoes. ✔ 【100% Satisfaction Lifetime Technical Support & 48 months Reliable Warranty】 We are confident that our indoor fly trap & mosquito lamp is manufactured under strict quality standards to offer our customers best experience. In addition, we offer a FREE REPLACEMENT POLICY without any costs from your side and 48 months WARRANTY, totally no risk for you! If you have any questions about this product by VIVREAL, contact us by completing and submitting the form below. If you are looking for a specif part number, please include it with your message.